Thanksgiving is just around the corner and we want you to feel prepared to steal the show with your wardrobe choices. Thanksgiving is one of our favorite holidays. With its focus on family, expressing gratitude and the brisk weather that tells us it’s time to bring out the velvet and fur accent pieces, we simply can’t get enough! Keep reading for our formula to creating the perfect Thanksgiving look. The holidays are back and that means velvet is here to stay. Check out our very own Jackie Lady, Dawn Darnell, flaunting our MISA Velvet Maxi, the perfect holiday statement look. Why worry about pulling the perfect outfit when you can keep things simple and flaunt what you’ve got in an elegant, festive maxi. If this feels too bold for you, consider some velvet flats or a crushed velvet clutch to bring the trend to life. Keep things classic this Thanksgiving with a neutral heel that you can pair with any look. Whether you decide to go bold, or keep things simple, a neutral heel will always serve you right. Consider our Schutz Bardot heel for your added boost of confidence to get you through the holidays! Click the little red button in the bottom right corner of your screen to talk to a stylist to see if we have your size. Arrive at your Thanksgiving feast in style with a classic handbag that can hold your favorite new plum lipstick and the rest of your essentials. No need to go big with an oversized tote. Keep your look minimalistic with a simple clutch or over the shoulder bag. 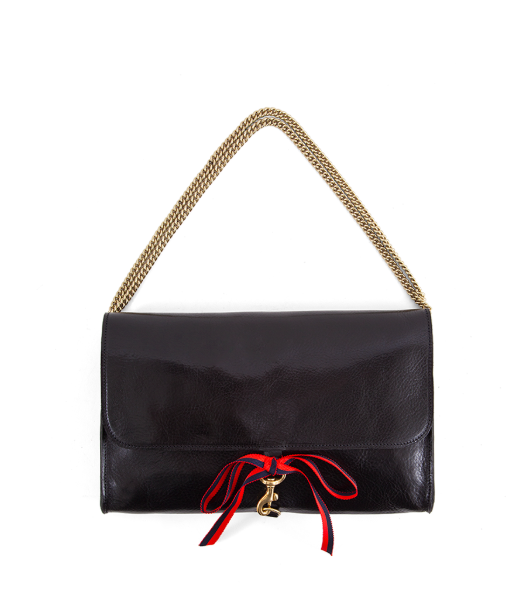 We love this Clare V Old Fashioned handbag. Just wait until you feel the leather. It has that worn, buttery, high-end feel that you just have to add to your leather collection. Plus, how festive is that little red bow? If you are wanting to flaunt your favorite pair of jeans but need to kick it up a notch, flaunt a statement top to dress up your look. We love this Wildfox Lyss Top. It’s festive, it’s classic and it lets you show some skin while keeping things classy. Click here to see this top on your doorstep in your next shipment! Not a Heel Girl? No Problem. Not everyone loves to flaunt heels for the holidays and that is more than okay. At Jackie, we’ve got a shoe selection you would drool over. These gold heeled, Schutz flats have the perfect touch of flare, all the while serving as the perfect basic for your holiday wardrobe. From Thanksgiving through New Years, you’re going to love having these shoes on hand.